Explore the picturesque Aberdares National Park in Kenya with steep forested ravines and open moorland. 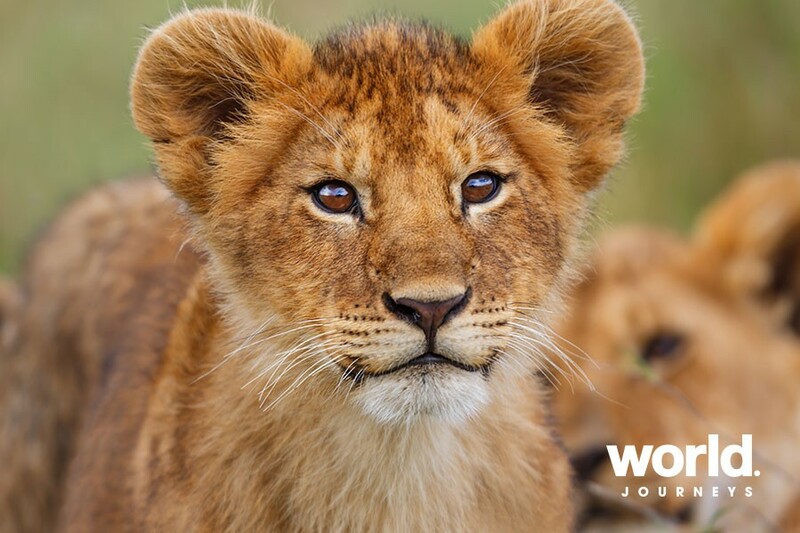 The park provides a habitat for elephants, black rhinos, leopards, spotted hyenas, olive baboons, black and white colobus monkeys, buffalos, warthogs and bushbucks among others. 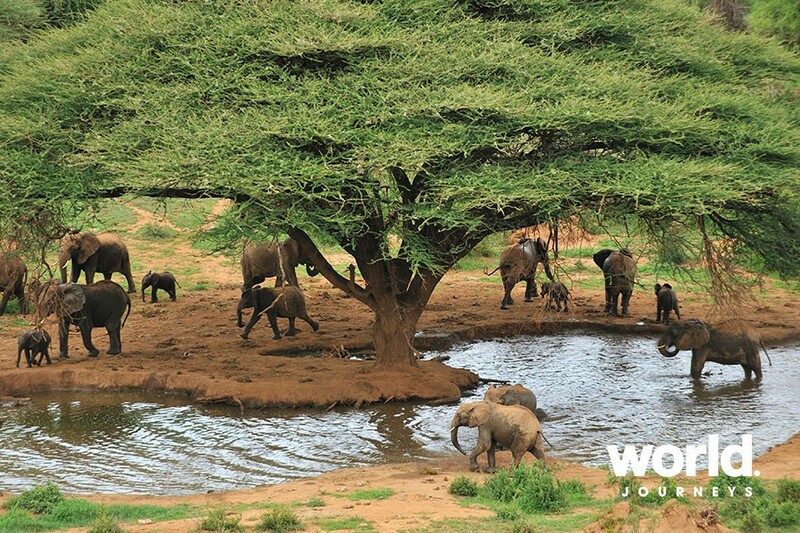 Then visit Samburu Game Reserve, a lesser known gem in Kenya. 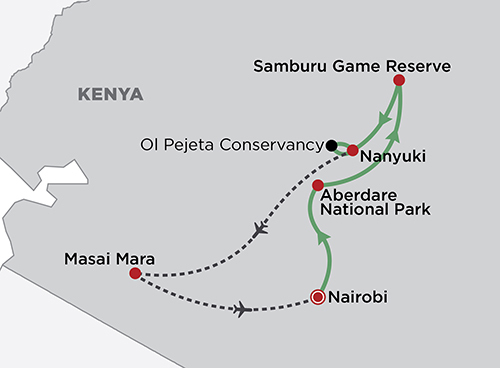 Visit the Ol Pejeta Conservancy for a morning game drive through the only chimpanzee sanctuary in Kenya. 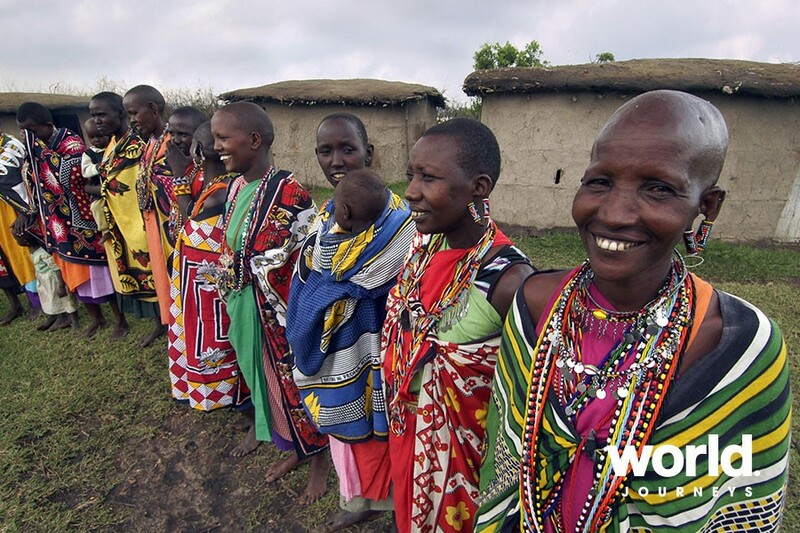 Then enjoy a scenic flight over the Great Rift Valley to see the Masai Masai National Reserve, a land of breathtaking vistas, abundant wildlife, endless plains and the Great Migration. 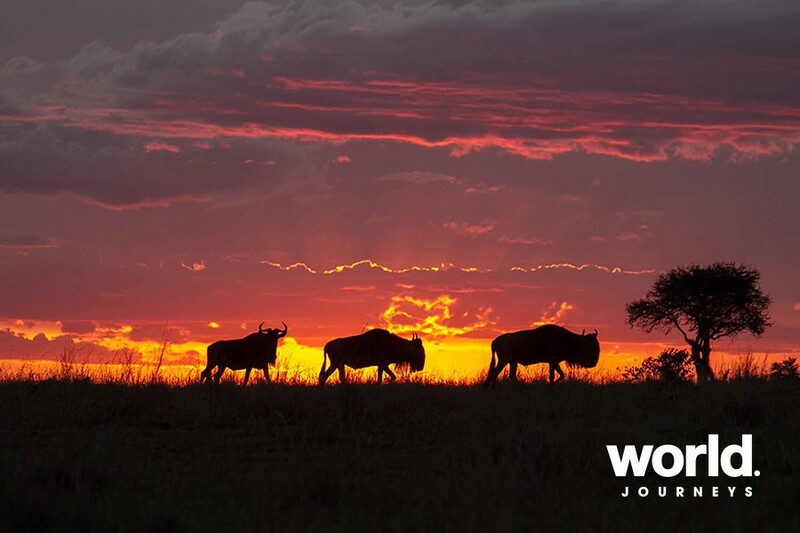 Enjoy daily thrilling safaris to try and spot the Big Five! Day 1: Nairobi Arrival at Jomo Kenyatta Airport, you will be met and transferred to your hotel. The rest of the day is at leisure. Day 2: Nairobi > Aberdares National Park After breakfast drive north towards the lush foothills of the Aberdares Mountain Range to the Aberdares Country Club for lunch. After lunch transfer to The Ark overlooking a waterhole and salt lick where the 'Big Five' occasionally gather for an exhilarating night of wild encounters. The Ark comprises of three decks from which numerous balconies and lounges provide superb vantage points for game viewing. Day 3: Aberdares > Samburu Game Reserve Breakfast is followed by check out. This morning, you will be transferred to the Aberdares Country Club where you will re-join your safari drive guide and proceed to the Samburu National Reserve. 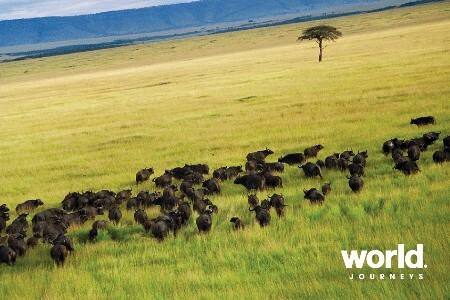 Rugged and remote, this wildlife reserve provides some of the best and most colourful game viewing in the country. Lunch at Ashnil Samburu Camp. 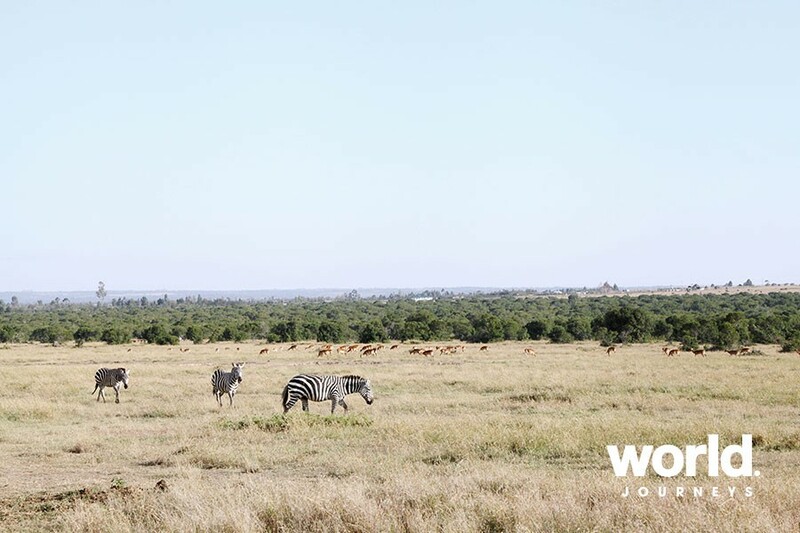 Afternoon game drives en-route to your camp. Day 4: Samburu Game Reserve All day spent in the Samburu Reserve with morning and afternoon game drive. Day 5: Samburu Game Reserve > Nanyuki After breakfast drive to the world-famous Mt. Kenya Safari Club founded by William Holden. On a clear day you will see the magnificent mountain in its full splendor. 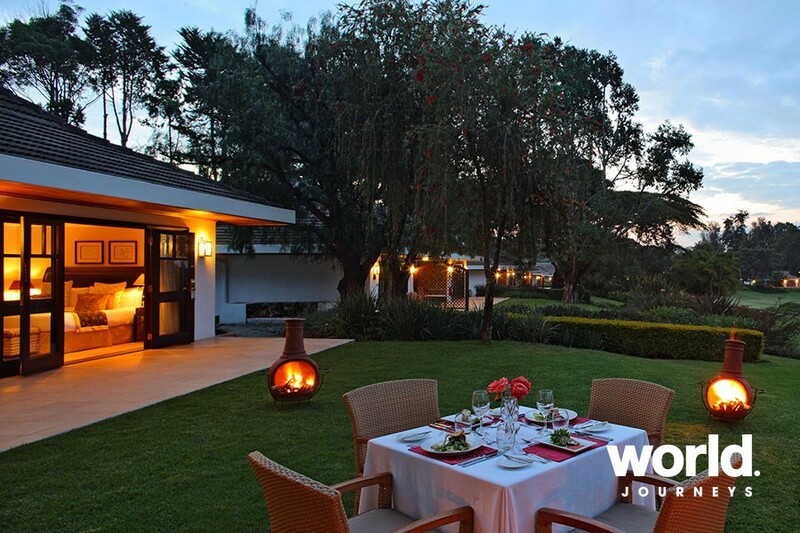 The club offers glorious views of the mountain and forest, delightful gardens, a 9-hole golf course and a splendid colonial-style ambiance with roaring log fires. 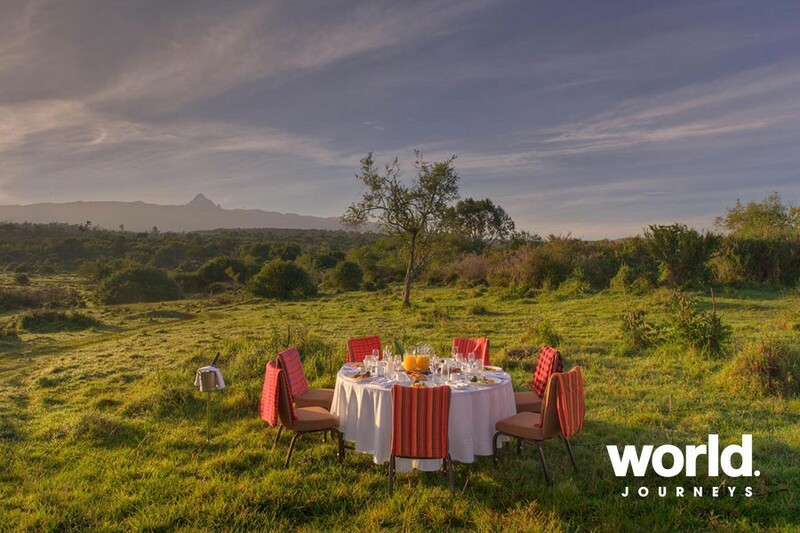 Arrive for lunch at your lodge, the Fairmont Mount Kenya Safari Club. 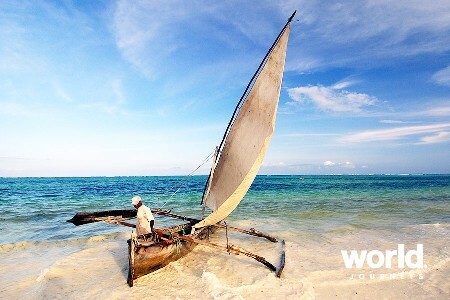 Afternoon at leisure with optional excursions from the lodge (at extra cost). Day 6: Nanyuki > Olpajete Conservancy > Nanyuki After breakfast, drive to The Ol Pejeta Conservancy for morning game drive. 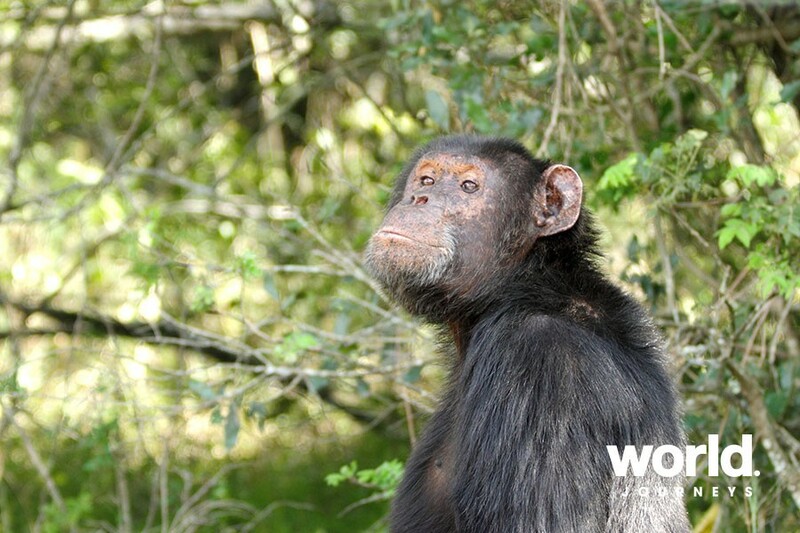 The reserve is home to the only chimpanzee sanctuary in Kenya. Return to your lodge for lunch. Afternoon at leisure admiring the magnificence of the mountain. Day 7: Nanyuki > Masai Mara Game Reserve After breakfast, transfer to Nanyuki Airport for your morning scenic scheduled flight over the Great Rift Valley to the Masai Mara National Reserve offering wonderful scenery and plenty of game. It is perhaps the only region left in Kenya where you may see animals in the same super-abundance that existed a century ago. 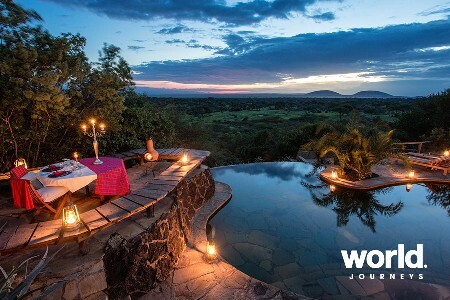 You will be met on arrival and transferred to The Fairmont Mara Safari Club. 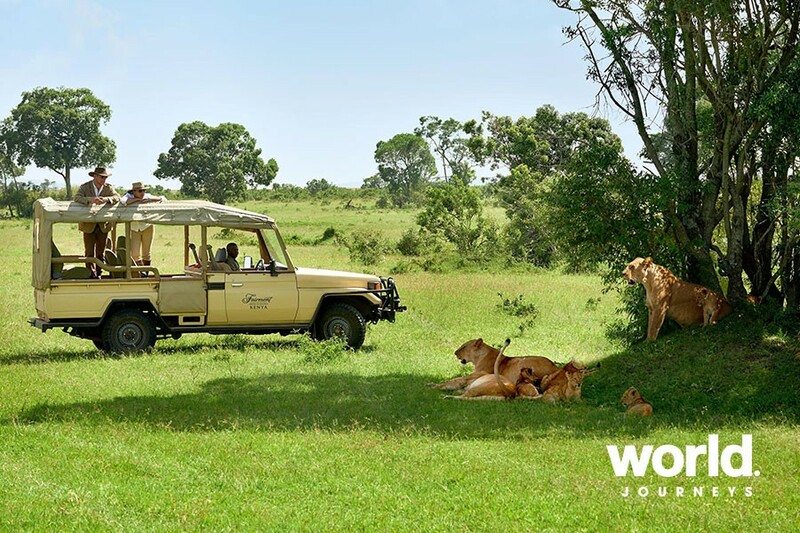 Enjoy an afternoon of shared game drives. 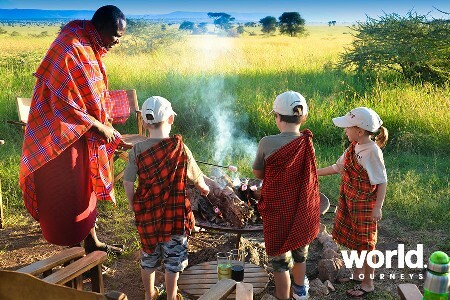 Day 8: Masai Mara Game Reserve Full day spent in Masai Mara Game Reserve with scheduled morning and afternoon game drives on a shared basis. 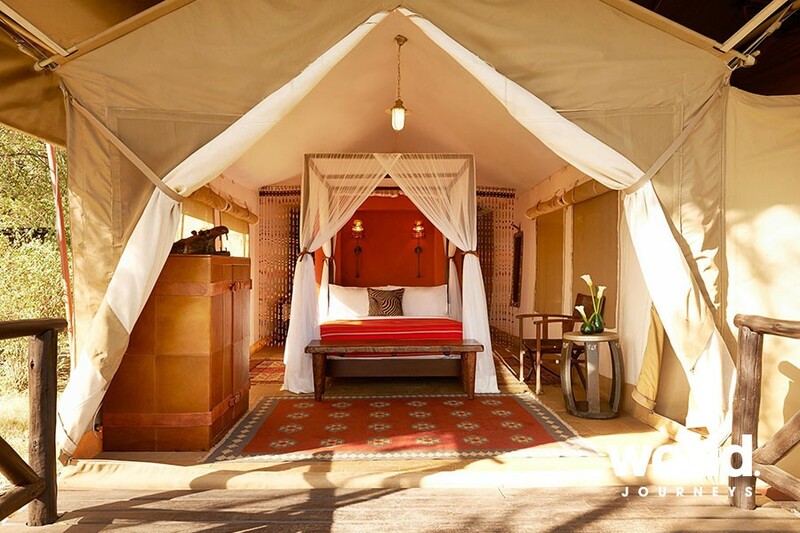 Day 9: Masai Mara Game Reserve Full day spent in Masai Mara Game Reserve with scheduled morning and afternoon game drives on a shared basis. 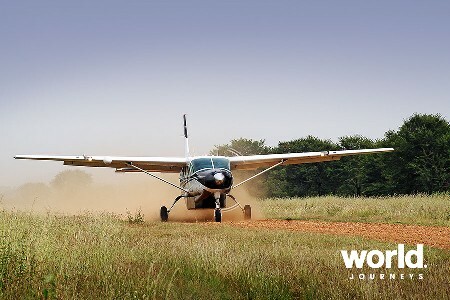 Day 10: Depart Masai Mara After breakfast, transfer to the airstrip for morning scheduled flight to Nairobi. You will be met on arrival at Wilson Airport and transferred to the famous Carnivore Restaurant for lunch. After lunch you will be dropped at your hotel or Jomo Kenyatta Airport for your onward arrangements.